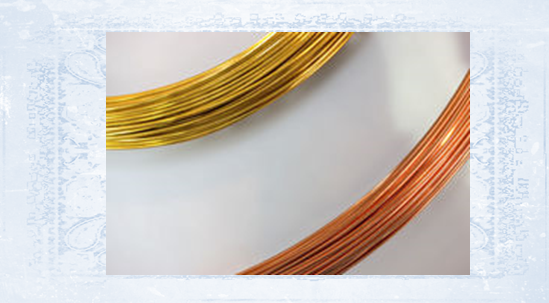 We offer BRASS & COPPER round “raw- no coatings” wire. Easy to work with right away or you can anneal to soften. Brass is naturally harder than copper. All Raw Wire - no coatings! 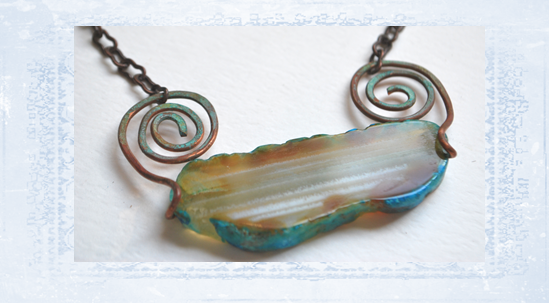 Our wire takes Patina perfectly & oxidizes to a beautiful finish! 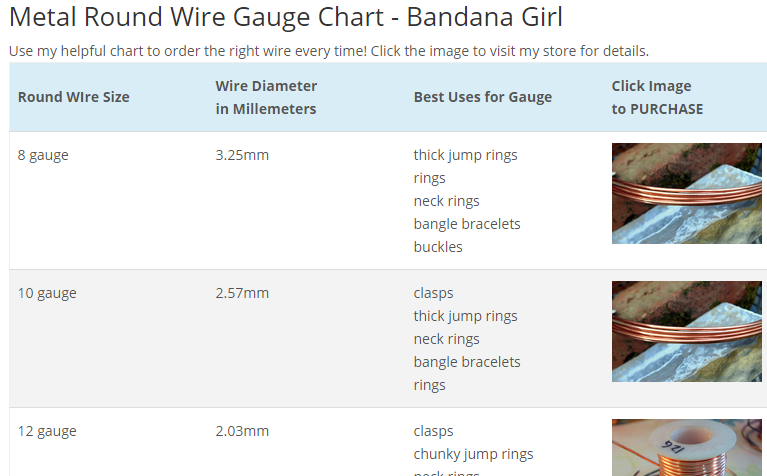 Here’s a great Gauge/Project Table to help you determine just what you need. CLICK HERE – to share our Chart to your favorite social sites! Don’t miss new tutorials, blog posts, sales and more! Sign up for our Newsletter! 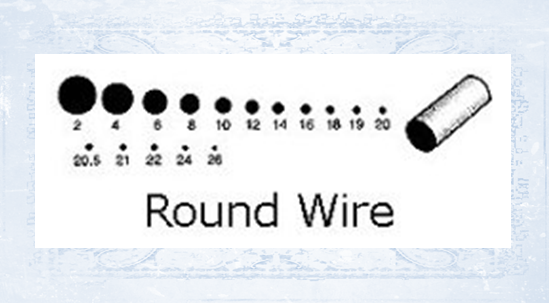 Have questions about wire choices? Please leave a comment below and I’ll be happy to get back to you! 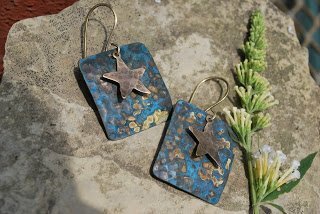 Another older tutorial…for patina lovers to try at home! Its fun! can try at home with terrific results! Set up your plastic container in a well ventilated area ~ the lid will be on for most of this procedure, but ammonia has a very strong odor…so outside in a covered area is a good place. I’ve used a plastic old deli meat container… large enough to place a few pieces in…(use a container that you can have specifically for this project and not for future food) ~ Plastic gloves are a good idea too! Lay two round flat stones on bottom of container and pour in just a bit of Ammonia …do not cover the stones with ammonia…just enough to cover the bottom of the container. Put the lid on for now. Texture the two brass rectangles anyway you like. The pieces pictured here are pre-hammered….Shaping the metal before you patina, is a good idea….it’s possible to flake off the patina if you bend the metal afterwards. Here I’m curving inward ~Take your brass pieces and scrub them (without water) with your scrubby, scotch brite/steel wool or brass brush ..this will bring a shine to your pieces….they are now ready to be patina’ed. Spray the shiny face side of each piece with with water to wet the surface. While not touching the shiny side with your fingers,(use plyers or hold the sides) place your brass charms on the stones in the plastic container face side up. Sprinkle coarse salt on the brass components…it’s ok if some of the salt spills into the ammonia…it won’t affect the outcome…just don’t let the brass piece fall in….if it does…just rinse, place on stone & re-sprinke the salt. How much salt on the metal is a personal preference. I try to give an even coat…so the pieces match for earrings…but if making pendants experiment with different amounts or even try smaller grain table salt..I like the coarse salt because it makes a much bigger pock mark. Place the lid back on the plastic container and wait around 24 hours…the fumes from the ammonia work with the salt and brass….you can peek occasionally… When you like the color it’s time for the next step ~ Here are the pieces ready to be rinsed! Look at that blue! Gorgeous! From here you can see the beautiful variation dark and light blue tones and bits of brass peeking through…to me this is just perfect! Now I’m ready to seal…. You can pick up an inexpensive lacquer at the hardware store…or you may have one in the workshop. 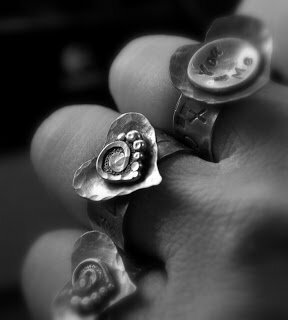 If your charms don’t already have a hole you can add one now or even before you start the patina process. I like to use a 1.5mm hole punch to make a big enough hole for the earring to swing easily from the ear wire. 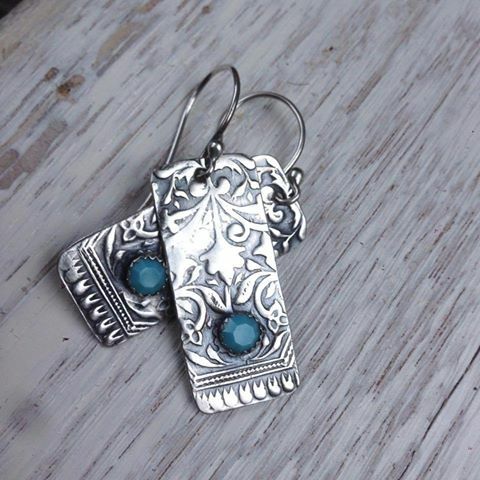 Attach your ear wire and charm to both pieces and you are ready to go! This is a super fun project and really easy to accomplish great results! TaDa! 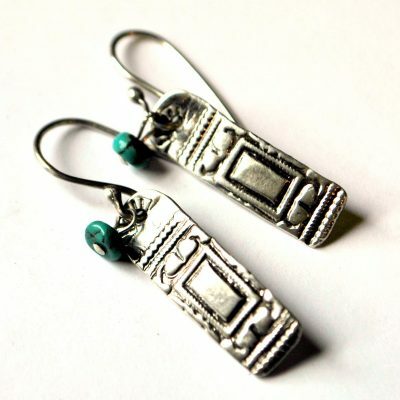 You have an amazing pair of artisan earrings and you did it yourself! Here’s a starter kit to make an earring set & necklace. I’m always available to ask questions too! Big thanks to Homesthetics.net for sharing this fun DIY! Please visit their website for tons of wonderful fun projects to try out yourself!